That day’s victory gave birth to a historical icon — Roosevelt-all mustache, eyeglasses and teeth-charging up San Juan Hill. For nearly a century, Americans have distilled the life of Theodore Roosevelt into this image, simplifying the complex man that was — cowboy, soldier, explorer, naturalist, father, writer, and, at age 42, the youngest president in United States history. 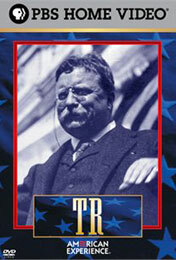 TR looks deep into the life of the man who embodied the confidence, exuberance of America at the turn of the century, revealing both the heroic and the tragic sides of Roosevelt’s character — the boundless energy that drove him, the bleak emotions he worked so hard to suppress, and the inevitable clash between the two. TR combines photographs, newspapers, motion pictures, and sound recordings; family diaries and letters — and interviews with scholars, historians, and Roosevelt family members to create a vivid and comprehensive portrait of this larger-than-life figure. The four-hour film is produced by David Grubin, seven-time Emmy Award-winning producer of FDR and LBJ, written by Grubin and historian Geoffrey Ward, and narrated by Jason Robards.